Summary: In this tutorial, you will learn how to make a triangle knot which would be helpful in braiding cord bracelet. 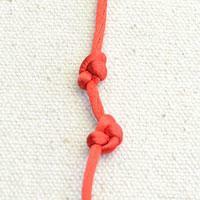 Triangle knot is basic knotting, and its name comes from its shape that you can see from the fowlling cord patterns. 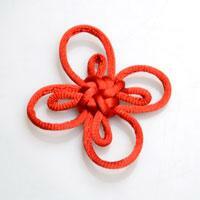 If you are fond of knotting, this one would be good to practise. Step 1: Prepare two nylon thread: a black and a red one. Step 2: Pull the black thread under the red one. Step 3: Take the red end and bring it upward. Pass it under the black end. Step 4: Bring that red end over the other red end and black then down through the black thread. Step 5: Pull the ends. So you have got triangle knot. You can continue to make more triangle knots until the length suitable for your wrist, you will find you just make a triangle knot bracelet!